Eastern Daylight-Saving Time (EDT) starts on March 8th, and March 20th is the first day of astronomical spring, or the vernal equinox. Although not perfect, the weather becomes a lot more tolerable this month, and the days are getting longer at a rapid pace. Getting dark later seems to be an equitable trade for the better weather after February’s extreme cold temperatures. 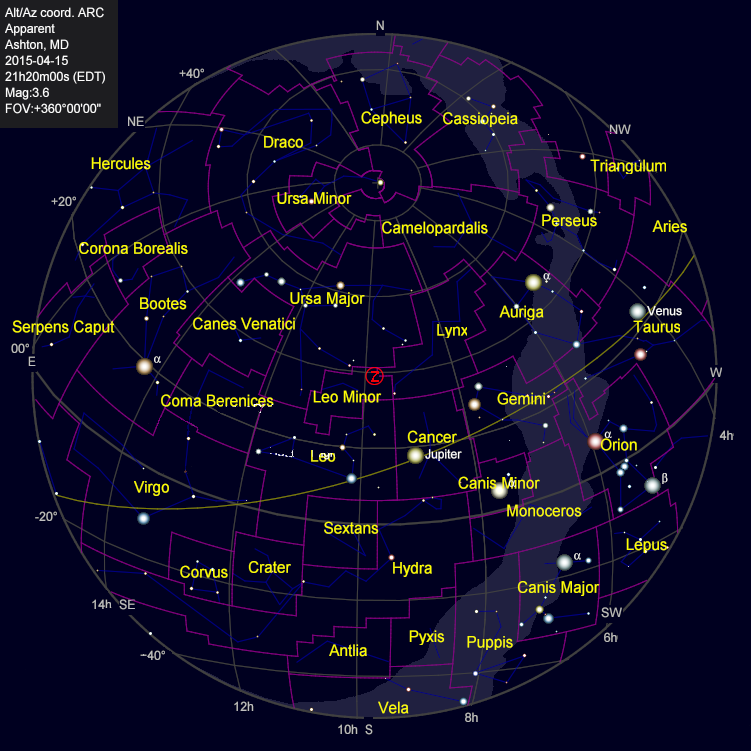 The sky map below represents the sky as it will appear in mid-March at the end of astronomical twilight, the arrival of complete darkness, at 7:45pm EDT. 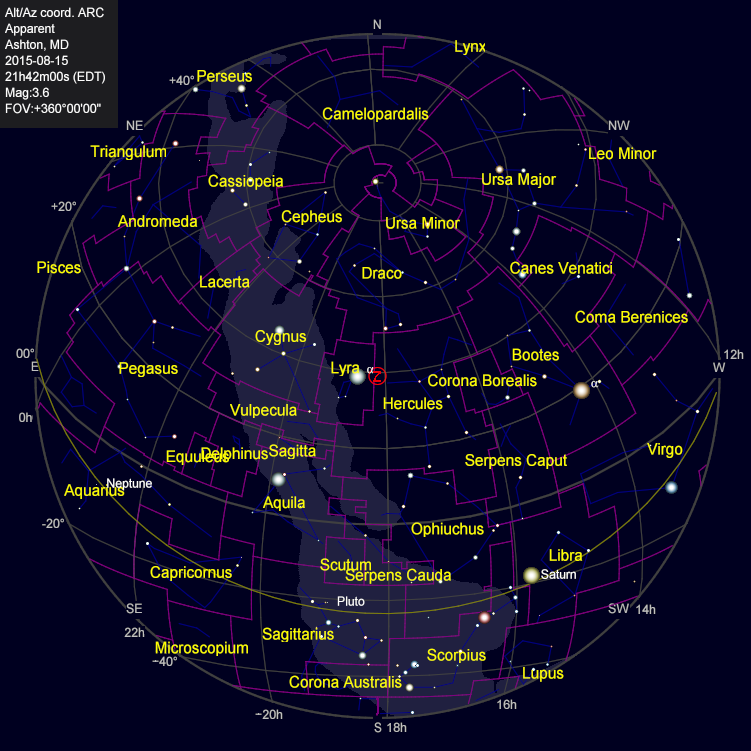 The Scope Out monthly focus is on the constellations that are just to either side of the meridian, which is near the 6th hour (6h) of right ascension line in the March sky map. 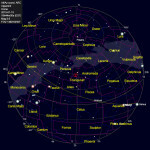 For a primer on how to use this sky map, please read How to begin Observing the Night Sky. 1. Circumpolar Constellations: Find Camelopardalis, Lynx, and Ursa Major in the northern sky above Polaris. 2. Northern Constellations: Orion still catches the eye, but it is beginning to march off of the stage on the western horizon. Find March’s remaining northern constellations, Cancer, Leo, and Leo Minor near the zenith. 3. Southern Constellations: The best-placed constellations in March are Hydra, Sextans, Pyxis, and Crater. Some of these constellations, Pyxis, Hydra, and Crater in particular, are difficult to view because their extreme southern placement prevents them from rising very far above the horizon. The April Sky at Nightfall. Jim Johnson. December 2014. Mercury remains hidden all month as it makes its pass around the far side of the Sun. Venus and Mars continue share the western horizon, and can be seen about an hour after sunset. While Mars grows dimmer and is placed a little closer to the sun each evening, Venus’ brightness will dominate the western sky after sunset, and will appear a little higher above the horizon each evening. Jupiter is just past opposition, and is already well above the eastern horizon after sunset. Saturn continues to rise earlier each evening, appearing above the eastern horizon about four hours after sunset. Uranus is on the western horizon near Venus and Mars all month, and can be glimpsed with optical aid about an hour after sunset. Neptune is too near the sun to be seen this month. Vernal Equinox – March 20, 2015 at 22:45 UTC (18:45 EDT). The Sun’s arrival at the zero hour of right ascension marks the vernal equinox, or beginning of astronomical spring. This is the point at which the ecliptic intersects the equator. which is why on this day the days and nights are of almost equal length. Read The Ecliptic – A Trace of the Sun’s Path across the Celestial Sphere for more information on the Sun’s movements on the ecliptic. Conjunction of Venus and Uranus – March 4th. This is the closest planetary conjunction of the year. Use optical aid to find Uranus about .3° below Venus. Notice the stark difference in their brightness. Scope Out is a monthly publication for casual stargazers in the mid-northern latitudes. It highlights the constellations that are highest in the sky and are therefore in the best viewing position at nightfall, describes the locations of the solar system’s planets, marks the date of the Moons phases and conjunctions with the planets, and it describes the interesting astronomical events that occur during the month. While most of us are ready for spring, the seemingly endless winter drags on. For the brave among us who can endure the cold nights, this is a great time for stargazing – it still gets dark early, the sky is generally clear more often, and some of the prettiest constellations are well placed for viewing right after sunset. At the very least, look up at the sky and take note of what you observe if you happen to be outside after dark in the evenings or before sunrise in the mornings. 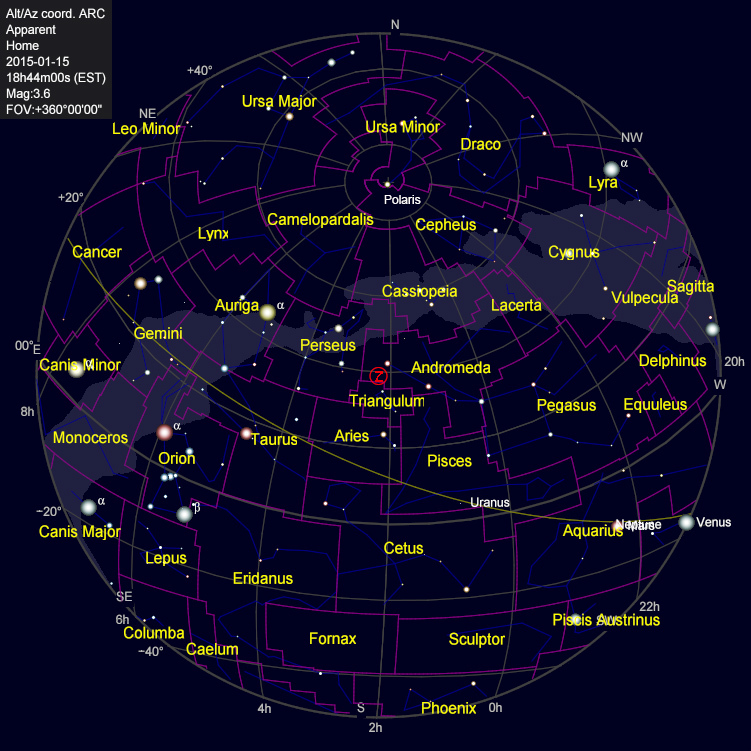 The sky map below represents the sky as it will appear in mid-February at the end of astronomical twilight, the arrival of complete darkness, at 7:15pm EST. The Scope Out monthly focus will be on the constellations that are just to either side of the meridian, which is halfway between 4th (4h) and 6th (6h) hours of right ascension line in the February sky map. 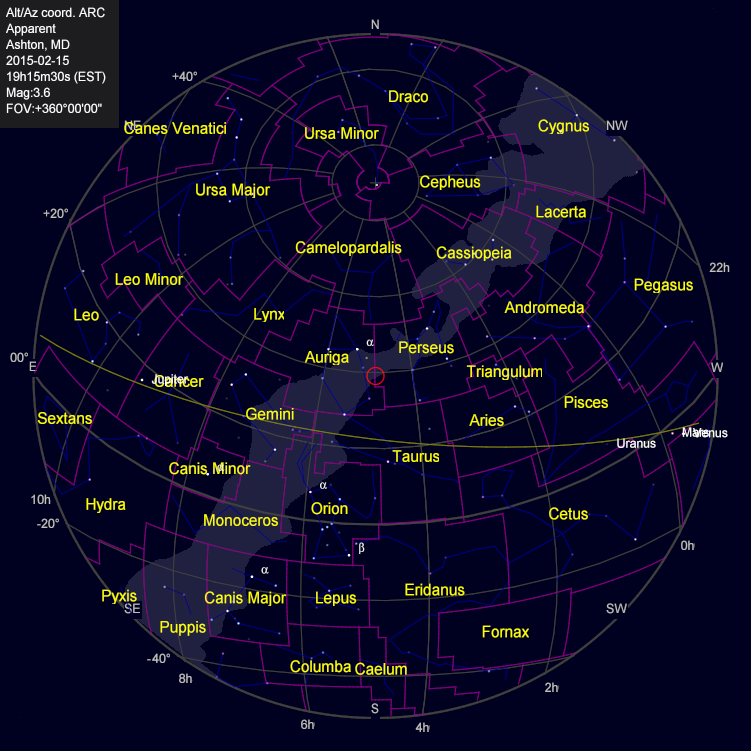 For a primer on how to use this sky map, please read How to begin Observing the Night Sky. 1. Circumpolar Constellations: Find Lynx, and Perseus in the northern sky above Polaris. 2. Northern Constellations: Orion is at its highest nightfall ascension of the year, a position from which it steals the night time show. Find February’s remaining northern constellations, Taurus, Gemini, Auriga, and Canis Minor, near the zenith. Be sure to look for the Pleiades cluster near Taurus, and the binocular view is breathtaking. 3. Southern Constellations: The best-placed constellations in February are Monocerous, Canis Major, and Lepus. Noteworthy among Canis Major’s stars is Sirius, the dog star, which is the brightest star in all of the night sky. Mercury is no longer visible in the western sky. By mid-month, this fleet-of-foot planet will have moved past the Sun, and will appear as a morning “star” by month’s end. Look for it low on the eastern horizon about an hour before sunrise on February 16th and 17th. Venus and Mars will share the western horizon, and can be seen about an hour after sunset. Venus will appear a little higher above the horizon each evening, and Mars will appear a little lower each evening. They will be at their closest approach, or in conjunction, as they pass one another on February 21st. Jupiter rises in the east just after sunset, and is at its closest to approach to Earth, or at l be in opposition, on February 6th. Telescope observers will not want to miss this! Jupiter’s four Galilean moons and its dark equatorial bands can be seen with the aid of a modest telescope. Saturn is presently a morning object, rising in the east at about 2:30am at the beginning of the month, and rising just a little earlier each morning. Uranus is located near Venus around month’s end, and can be found with binoculars or a modest telescope. Neptune is near Venus at the beginning of the month, but this dim planet will be very difficult to observe in the twilight. Happy New Year, and welcome to Scope Out Next Month’s new layout and simplified format. As the first year of Scope Out approaches and descriptions of all of the constellations and annual events have been reported once, there is no need to re-write that material every year. Instead, I have prepared brief posts with descriptions and images of all of the constellations visible from our northern hemisphere location. Now, I simply need to identify which constellations are visible at nightfall in a given month, and a star gazer can click on a link to any of those constellations for more detailed information. Although I have not written posts for all of the annual events such as solstices, equinoxes, and meteor showers, I intend to give them similar treatment as these events come along later in the year. Scope Out is a monthly publication for casual stargazers in the mid-northern latitudes. It highlights the constellations that are in the best viewing position at nightfall, describes the locations of the solar system’s planets, marks the date of the Moons phases and conjunctions with the planets, and it describes the interesting astronomical events that occur during the month. 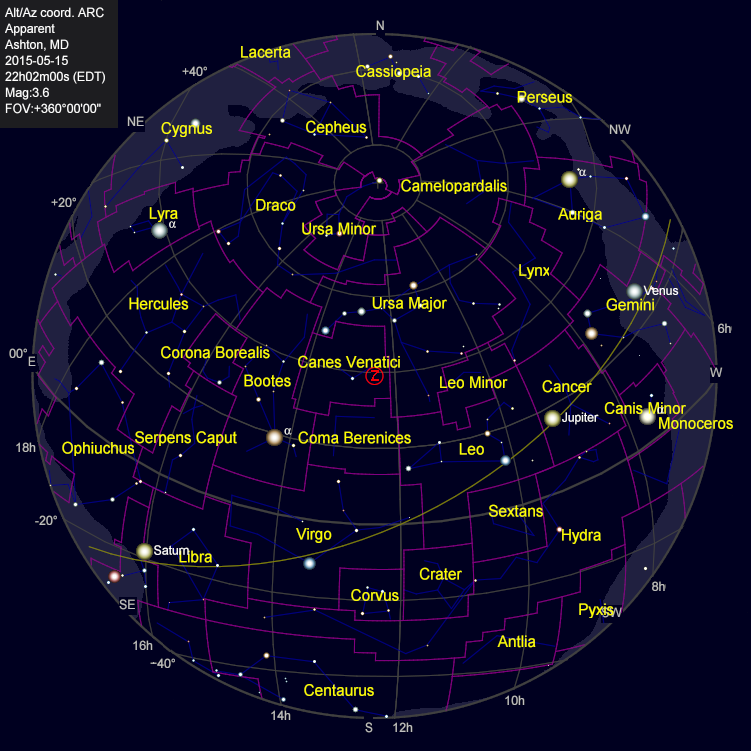 The sky map thumbnail represents the sky as it will appear in mid-January at the end of astronomical twilight, or complete darkness. The Scope Out monthly focus will be on the constellations that are just to either side of the vertical line that begins near Polaris and extends downward toward the southern horizon, roughly the 2h right ascension line in January. This line, the meridian, is important because these constellations are at their highest point in the night sky. Due to the Earth’s rotation, these constellations will move across the sky toward the western horizon as the evening progresses, and new constellations will rise above the eastern horizon to take their place. Although not yet at its highest placement, Orion is already beginning to steal the show as it continues to rise just a little higher above the eastern horizon each evening. The circumpolar constellations are those sufficiently close to Polaris that they do not set, but merely rotate around the pole star. The implication is that these constellations are visible all night from our northern location. January’s circumpolar constellations that are in the best viewing position on the meridian are Cassiopeia, Lacerta, Cepheus, Camelopardalis, and Perseus. The northern constellations generally rise in the east, pass directly or nearly directly overhead, and then set in the west. These are the most easily observed constellations when they are on the meridian, because their high placement in the sky make them the least affected by atmospheric haze, and the least likely to be blocked by obstructions such as trees or buildings on the horizon. January’s best northern constellations include Pegasus, Andromeda, Pisces, Triangulum, Aries, and Taurus. The southern constellations tend to hang low in the southern sky, never rising very far above the horizon. These constellations generally rise in the southeast, make a brief appearance above the horizon, and then set in the southwest. The best-placed constellations in January are Cetus, Eridanus and Sculptor. Look for Mercury low on the western horizon at dusk until mid-month. It reaches its greatest elongation from the Sun, which is its and most favorable viewing opportunity, around January 13th. Mercury and Venus are in conjunction on January 10th, and Venus will continue to increase its elongation from the Sun throughout the month. Mars will can be found low on the western horizon all month, setting at around 8pm. Jupiter begins the month rising above the eastern horizon about two hours after sunset. It rises a little earlier each evening, rising about half an hour after sunset by month’s end. Saturn is presently a morning object, rising in the east at about 4am at the beginning of the month. It will rise just a little earlier each month, rising at 2:30am by month’s end. Uranus begins the month rather high in the sky in the constellation Pisces, and can be viewed with a binocular or modest telescope. Neptune is lower toward the western horizon than Uranus, and can be most easily found on January 19th when it is half the full Moon’s diameter to above and to the right of Mars. 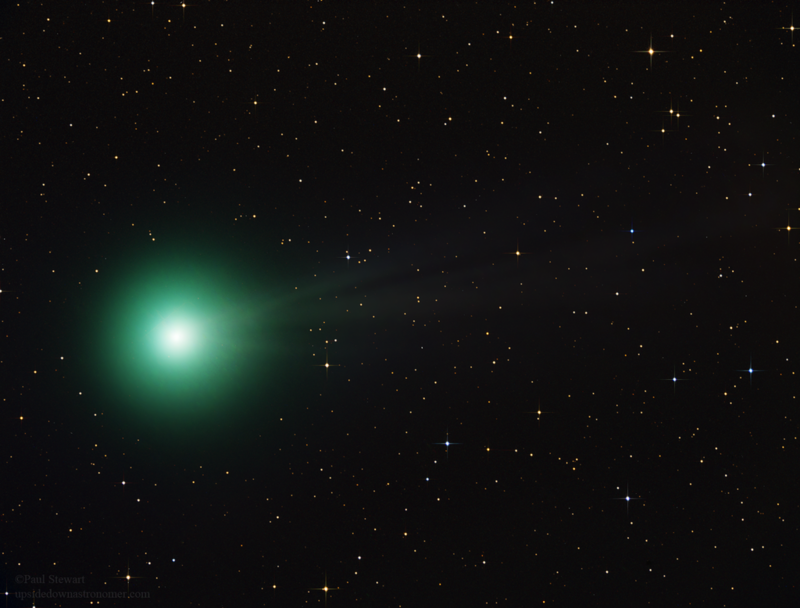 Also known as C/2014 Q2, Comet Lovejoy will be visible all month. It will be difficult to view without binoculars during the first week of the month until the Moon’s phase progresses a few days beyond full on the 4th. Starting around January 7th, look for it as a naked eye object to the west of Orion, moving toward the north, northwest for the rest of the month. 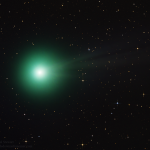 Sky & Telescope magazine published an article on Comet Lovejoy that includes star charts to help locate the comet, and periodic updates to report the latest observations. A study of the Orion, Eridanus, and Taurus star charts to become familiar with these constellations’ placement relative to one another and their star patterns can before getting outside can be helpful.